Hi, everyone. PuzzleGirl here covering for Orange who is not feeling well At All. Poor thing! I'll check in with her in the morning and see how she's doing, but you might be stuck with me all day. Hey, it could be worse. I'm just going to do a quick write-up to get things started and then you all can have at it in the comments. It all seems so simple now. Sigh. •11D. Trim the hedges, courtesy of TRIM THE TREE [Prepare for Santa, in a way]. This one's confusing. It's the only verbal theme-phrase and the base meaning needs the Christmas context so that we read "trim" as decorate and not tidy/cut. The word tree in the fill is also problematic as there may be trees in the yard. Why not TRIM AND TONE [Popular health-club workout?] or something nautical rather than botanical like "TRIM THE SAIL" [Request of Michael?]? Something that isn't UNCLEAR [Hazy], please. •53A. Prune the bushes, compliments of PRUNE DANISH. As was the case with yesterday's puzzle, I found that I enjoyed the non-theme fill considerably more than the theme-fill. To borrow from the puzzle (but not to be SASSY [Impertinent]), it's simply less cut and dried. Using the fill, I like that I can tie together the idiomatic BAD RAPS [Unjust judgments, slangily] with reasons some folks earn 'em. "She's the SPOTTIEST [Most erratic] employee when it comes to clocking in. Sure, she's always around at TEN A.M. [Coffee break time, for some], but when she goes back to the selling floor, face it: she's [Unambitious to the max] SHIFTLESS! Except for the paycheck, she probably RUES [Regrets] the day she ever walked in here..." I also like the way [...to the max] does not deliver an adjective ending in "-est." Sneaky. Good. I like the crossing of EGG [It can be scrambled] and EGGAR [Actress Samantha of "Walk, don't Run"]. The "alphabet soup" fill is also nice with T-BARS [Ski tows], MR. T ["I Pity the Fool" star] and B-GIRL [Female hip-hopper]. I almost added A-BEAM to the list, but that word's ABEAM [At right angles to the keel]. Oops... Among today's SIDE ISSUES [Incidental topics] is the B-Girl Scholarship available at St. Paul, MN's McNally Smith College of Music. For some aspiring performer or musicologist, this is very cool and probably GODSENT news [Very timely, as an unexpected blessing]. Did somebody say "yoga"? I just read this on Twitter: "i've been doing some reading. turns out, the bhagavad gita never mentions yoga pants." 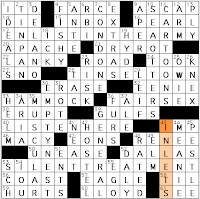 I refer you to my L.A. Crossword Confidential post for my thoughts on this puzzle. 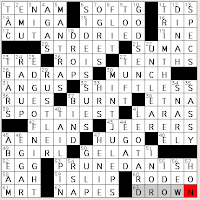 Brendan Quigley's blog crossword, "Themeless Wednesday"
The last square to fall was the D in MONARDA, [Perennial family that includes bee balm and horsemint]. Say what? • BABY FAT is [Children's coat?]. Lively entry. • USED CAR is a Ford [Focus that might be a little off]. My mom bought a Focus about 8 or 9 years ago when there was a new model and regretted it—now she drives a tried-and-true Toyota Corolla with fewer repair needs. • "RIUNITE on ice, that's nice." Is ["America's All-Time Favorite Italian Wine"] still available, or did it vanish by the '80s? • ROSIE the Robot? [She works for Mr. J], J for Jetson. • WOWED 'EM is nice. • [Cabbage from the Far East] is YEN, "cabbage" being slang for "money." • "THE TWIST," good song, good fill. • [Run off] clues XEROX. Wasn't expecting that. Erased ESSEX, in fact, because I figured the beginning X was impossibly wrong for [Run off]. • If you type *headdesk* in an online setting, your readers gather that you're beating your head against your desk, expressing stupidity or, more often, futility. HEADDESK is clued as an [Expression of frustration, in modern day slang]. Just last week, Brendan had FACEPALM in another themeless, and I asked why it wasn't mini-themed with HEADDESK. So here the answer is, a few days later. • 18A. [Revealing photos of an old movie actress?] are Fay WRAY'S X-RAYS. One possessive, one hyphenated plural. The X is ONE letter past W.
• 23A. If you ANGLED ANG LEE, you [Set an Oscar-winning director at a slant]. One verb, one full name. • 41A. [Cotton fabric for chadors?] is MUSLIM MUSLIN. Adjective, noun. Muslin takes its name from the French mousseline in turn derived from Mosul, Iraq, where the fabric was made. This pairing may be more apt than I first thought. • 51A. [Problem for superpowered pickup artists?] is HEROES' HERPES. The square daily newspaper puzzles never seem to have HERPES, do they? • 60A. BOSOX BOTOX is clued as a [Treatment to keep a ball club looking youthful?]. I wonder if this was the seed entry. • [Gay prostitute customer Haggard] is named TED. • The [Family name in ___ history] is CURIE for science, FOYT for racing. • [Trenchcoated antiheroes] are P.I.'S. 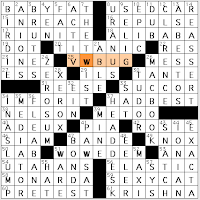 Wait, antiheroes shouldn't be in a clue when HEROES' HERPES is in the grid. • [It might require Java] clues an APPLET. Yup. • [Fought-over leftovers] are an ESTATE. • OXO isn't just an [Ergonomic kitchenware brand] anymore—they make office supplies. I have their clipboard. • ["The world's local bank"] clues HSBC. I have never heard of this. • [Hip-hop's Das ___] EFX? Never heard of him/her/them. I don't suppose Das EFX is/are German? • [Matador, e.g.] is a LABEL? Never heard of it. • XKE is clued as a [Jaguar make]. I think someone recently was saying that nobody ever really referred to it as the XKE, but I just heard Click or Clack, one of the Tappet brothers, invoking the XKE last weekend. • KAREN O is the vocalist for the Yeah Yeah Yeahs, Wikipedia tells me. She's also a ["Where the Wild Things Are" soundtrack artist]. 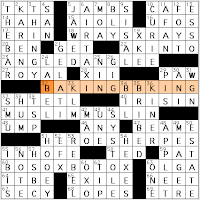 Kosher to have Things in this clue and THINGY as the very next answer?